Hydrophilic PTFE membranes offer maximum chemical and pH resistance with minimal aqueous extractables (<0.3 wt percent ). 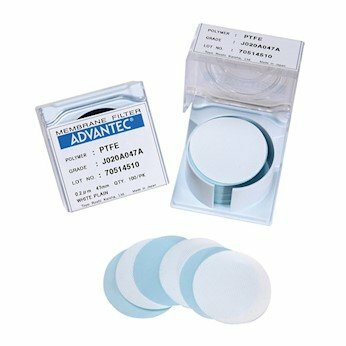 Since the filter is optically clear when wet it is ideally suited for culture and microscopic examination of cells/particles captured without requiring a separate step. Maximum operating temperature is 100°c (212°f). autoclaving and allowing filter to dry will render it hydrophobic. If you have any questions about this product by Advantec, contact us by completing and submitting the form below. If you are looking for a specif part number, please include it with your message.